Well, another week has come and gone! And as the locals would say about Bozeman, everything’s great in the Bo-zone. I shudder to imagine what the weather must be like back home… I’m hangin’ out in 70 degrees, and it’s great! I guess I’ll start with the most interesting/exciting news first… we got bikes! On Wednesday, our zone leaders dropped off our brand spankin’ new bikes for us. We’re the only sisters that get them in Bozeman right now because they are running short on bikes and our area is the most “compact”. I love getting to bike! Bozeman is a pretty “all-natural” and “go-green” place, so there are bike lanes in all the streets and tons of bike trails. Everyone here bikes, so it’s nice to not be the only ones! I had to get a bell for my bike though so I could warn pedestrians when we come up behind them, cause there is a lot of foot-traffic too. Bozeman is kind of on a slope, so biking south is a good workout for sure! The bikes are such a blessing though, cause now we can stop and talk to people or serve them. Pulling over the car to help someone take in their groceries just makes you look like a weirdo, haha. Hmmm, what interesting things happened this week. Well, on Wednesday we were looking for a store to go talk to a referral, and we almost walked in to a medical marijuana place. Oopsies! We were all like, “ugh, it smells weird over here”. Well, I guess we found out why… haha. We didn’t end up finding the referral yet, but we’ll keep trying! On Thursday, we volunteered at the food bank like usual and we packaged little bags of pasta for like three hours. We played 20 questions with the other sisters doing it with us, and I learned that I am terrible at geography! Gonna have to work on that after the mission. This week in my personal study, I am finishing up the book of Alma. 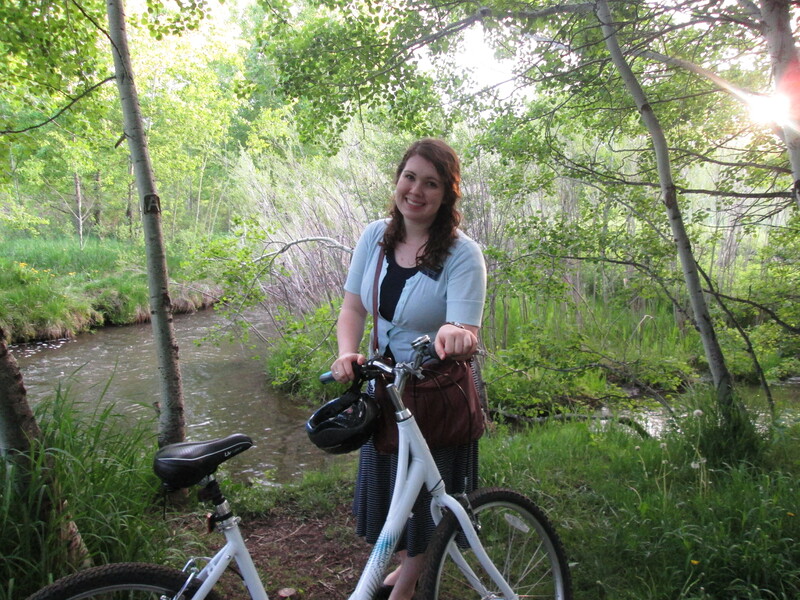 As a mission, we are all finishing the Book of Mormon by the end of June, so I’m ahead of schedule! I also started the book of Revelation in my New Testament reading. I was kinda nervous about it, but it’s turning out pretty well so far! There is so much doctrine in it, and it is so motivating because of the promises of good always overcoming the evil. Heavenly Father remembers still His covenants! This weekend, we got to take our progressing investigator to a baptism that 2nd ward had. The entire service was in Spanish though! She still was able to feel the Spirit and loved it. We’re re-teaching her all of the lessons, and she should be baptized hopefully by the end of the transfer. We also were able to set up some appointments with some new less-actives this week, which was great! Tomorrow we have Mission Tour with Elder Godoy from the First Quorum of the Seventy in Billings. One of the Assistants called last night and asked if I would be the pianist for the general session. When he asked if I could play Called to Serve, I said of course, but then he said, “No, can you PLAY Called to Serve? I hate it when it’s slow! It needs to be peppy!”. I assured him no worries, cause goodness knows I hate slow hymns too! I was also given a nerve-wracking assignment in addition. While there is a leadership meeting from 8-9am, the rest of the missionaries will be in the chapel. And the AP asked if I would be a discussion leader with an Elder who I don’t know for that hour! So basically we’re leading a discussion for an hour for half the mission on whatever topic we want. *Gulp*! PRAY FOR ME! Well, that’s all folks! I love you. Hope you have an awesome week! !